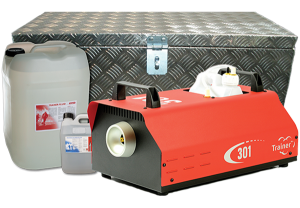 The Trainer 301 Kit is a mid-sized, portable smoke machine with enhanced output to provide a continuous flow of dry dense smoke. Water resistant, the 301 uses a multifunctional remote for easy command access and provides an economical solution for your needs. Suited for a wide variety of applications, the Trainer 301 is extremely quick to heat up, meaning greater control of smoke when you want it. Click to view Size (LxHxW) 485mm x 335cm x 242cm. Heat Exchanger: 1000w with 7 minute heating time and overheat Protection. Coverage: 660Cubic meters (23307 cubic feet) per Min and rated continuous (at lower Output). Control: Remote analogue controler with 5 pin din socket and 5 meter cable. Size: (LxHxW) 500mm x 225mm x 165mm.